This test is part of the training course Project Management: Getting Things Done. The program explores ISO 25100:2012 and provides tips and techniques for both quality professionals and project managers working together on cross-functional projects. The test will take less than 15 minutes of your time, and will give you a benchmark of your overall knowledge of the subject matter covered in the program. Please read the questions carefully - only one submission is allowed! The Quiz has to be completed at once - navigation away from the Quiz page will clear out Your selections! This is a pre-test of your knowledge of project management principles and methods to use as a baseline of your existing knowledge prior to working through this course. This quiz will be offered again at the end of the course to confirm your understanding of new information. While all answers may have a valid point of view, choose the best answer for each question. 1. What is ISO 21500? 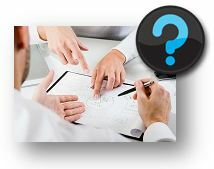 2. Who should have a familiarity with ISO 21500? 3. Who should have deeper knowledge of ISO 21500? 4. Why is it important for quality professionals to have a significant understanding of project management principles and methods? 5. What type of organization is the guidance for project management best used to support? Want to know more? Check out our Project Management: Getting Things Done training course.